This Notebook Stand has Two Height Adjustable Shelves! This Display Nicely Meshes with Any Decor! This Notebook Stand has a Matte Black Finish! Ergonomic tilting surface is ideal for writing and typing. 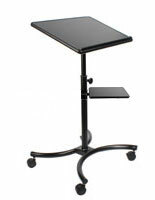 Height adjustability allows display to be used as a presentation lectern. (4) Wheels for mobility, including (2) locking casters. This notebook stan is an affordable trade show option. 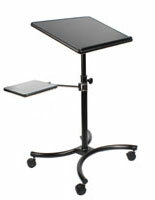 This display has a 20" x 16" surface, giving users plenty of space for any items they may need for work or a presentation. 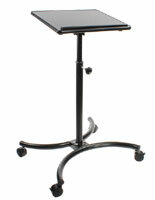 Raise the height of this black notebook stand to turn it into a lectern, or lower it to use as a work desk. This unit comes with a small shelf that clamps onto the pole below the work surface. 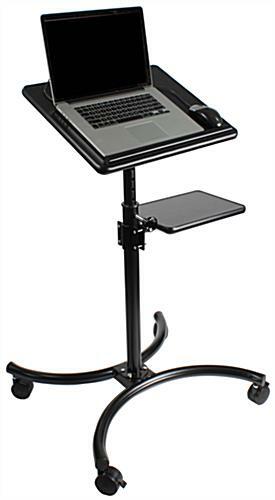 Use the extra shelf on this notebook stand that is for trade shows for storage, or use it for multimedia like a projector during a presentation. The secondary shelf can be attached at different heights along the base pole. 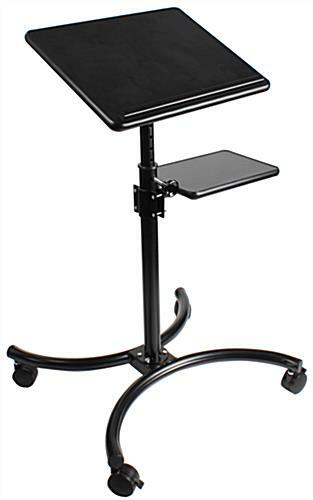 This adjustable notebook stand is ideal for ergonomic work stations. This computer desk has (2) locking wheels. The black matte finish on this notebook stand meshes with any furnishings. 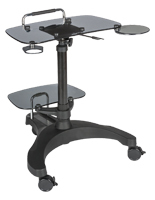 The steel base has a curved design that really makes this display stand out. Adjust this notebook stand that is contemporary to the height and angle that best suits your needs. The surface of this computer desk features a lip at the bottom to prevent any items from sliding off when tilted. 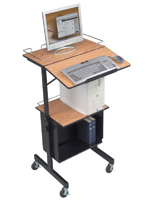 This ergonomic display, notebook stand use several knobs that are easily twisted to adjust height and shelf angle. This display is great for residential or commercial use! 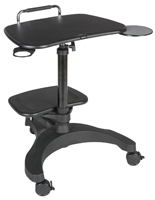 This notebook stand that has an adjustable tilt surface will fit comfortably in any personal office.